Capturing Cardiff – how the dance scene is surviving budget cuts | Dance first. Think later. The Cardiff dance scene is still battling to stay alive despite recent budget cuts, thanks to a handful of dance groups in the city. After the announcement of the brutal curb on funding in all governmental departments, the end seemed nigh for the dance scene in Cardiff – which, in comparison to other major UK cities, is seemingly underdeveloped. However, all is not lost. A small number of dance groups are keeping the ball rolling for dancers in Cardiff, both independent and council-funded. One of the groups flying the flag for Cardiff is student-run hip-hop group SLASH. For the past three years, the dance group which originally started out as a musical theatre society has made a concerted effort to spread their influence across Cardiff, offering as much as possible in attempt to develop the dance scene in Cardiff. And now, courtesy of SLASH hip-hop group, Cardiff are able to jump on the growing hip-hop trend. SLASH provide open dances classes throughout the week on a casual basis, as well as putting on workshops with professional choreographers and performing in venues across the city. The group receive no funding from the council and pay for the costs of studio hire through admission fees for classes. Kimberlee Steele, a 24-year-old Masters student at Cardiff University, is President of the society, accompanied by Vice President Francesca Parma, 21, who is also a student. Both of the girls started as beginners, attending classes on a weekly basis. Although they had previous experience in other genres of dance, both Kimberlee and Fran had never had any hip-hop experience. The SLASH committee put in their best efforts to try and get the most out of the society and its dancers. Kimberlee and Francesca make regular trips to London, taking classes at open studios – such as Pineapple Dance – to gain inspiration for choreography. Trips to London have also enabled the pair to build up an impressive contact network – which proved more than useful for the society’s most recent workshop, which took place in November. The SLASH 2010 workshop played host to a range of choreographer elite, treating hip-hop enthusiasts to two jam-packed days of different styles of hip-hop dance, ranging from Nu Flow to House Dance. Rubicon Dance is the council’s answer for establishing a dance culture in the community. The community development project provides dancing opportunities for people of all ages from Cardiff in Newport. Based in Adamsdown, the school not only runs open classes for the community but also provides training opportunities for those who wish to persue a career in dance, or simply use their dancing skills to volunteer within society. The project receives funding from a number of sources, including the Arts Council, both Cardiff and Newport council, and additional funding support for the full time training course from the Workers’ Educational Association (WEA). Cardiff Council are also providing funding to export dancing talent out of Wales, by collaborating with a professional dance company to provide support for those who are thinking of taking up dance professionally. Future Dance Cardiff is a scheme set up and run by the National Dance Company of Wales (NDC Wales). The scheme provides workshops and advice for promising young dancers, as a leg-up into the profession which is notoriously difficult to get ahead in. The workshops are taught by professional members of the dance company. Future Dance Cardiff is a progressive scheme which supports their dancers right up until they gain success from auditions – three participants have recently been accepted to the prestigious Northern Ballet School. 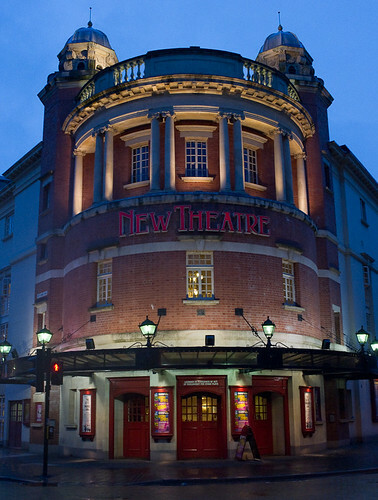 Promising dancers travel from far and wide to attend the Future Dance Scheme, which runs in association with the New Theatre, Cardiff. This entry was posted on Friday, December 17th, 2010 at 2:41 pm	and tagged with Azrul Aminudin, Cardiff Council, Future Dance Cardiff, National Dance Company of Wales, NDC Wales, New Theatre Cardiff, Newport Council, Rubicon Dance, SLASH Hip-Hop and posted in Ballet, Choreographers, Dance class, Dance schemes, Hip-Hop, Interview, Professionals, Workshops. You can follow any responses to this entry through the RSS 2.0 feed.